On a bright sunny day in February, a short drive in the shadow of the Klein Drakenstein Mountains brought us to Avondale, a beautiful modern winery established in 1997. At the door we were greeted with a glass of Armilla Blanc de Blanc 2011 bubbly (9:45 in the morning, don't mind if I do) and shown around the plush interior, taking a seat in the tasting room to wait for the tour to start. Our guide for the morning was Jade, who has worked at Avondale for nearly six years and is therefore more than qualified to give a thoroughly entertaining and informative tour, starting 10 meters underground in the cellar - which happened to be in complete darkness due to a power outage. Avondale is an entirely organic winery that uses innovative biodynamic processes pioneered by the founder, Johnathan Grieve. In the pressing room we learnt more about these natural processes, and in the barrel room we walked amongst the enormous clay pots used for fermentation; an ancient method of making organic wine. Avondale is also the proud owner of several Kvevri clay pots, shipped all the way from Georgia and buried in the earth to keep the wine at a natural cool temperature. Back in the light of day our carriage awaited... an adorable red tractor towing three wooden carriages with comfy seat cushions, each emblazoned with the Avondale logo. Once we were settled under umbrellas to protect us from the searing mid-morning heat, the tractor trundled through the many plum trees and flower gardens, past luxury guesthouses and residential homes. The ride is incredibly bumpy so there wasn't much commentary on the journey up the hillside, but at the top we reached a glittering reservoir that made the perfect location for a scenic rest stop - and the first glass of wine. As Jade told us about how winemaking is influenced by the phases of the moon and the affect this has on the water in our bodies as well as in the wine, she poured us a glass of Avondale Anima, a Latin word meaning 'soul' which the winemakers chose to represent how soil is the soul of wine production. Behind us was a small vineyard that looked rather unkept and unloved, which Jade informed us was the 'baboon vineyard', specifically built to keep the pesky baboons that eat all the grapes satisfied before they reach the real vines - clever! Back on the move we headed down the mountain again and through the main vineyards, basking in the warmth of the sun and watching the myriad of butterflies and birds swoop above us. The next stop on the tour was a real treat; the Duck Mobile. Feeling like a kid in their element at a petting zoo, we watched around 40 ducks calmly waddle in an orderly fashion up a ramp into the back of a van, ready for transportation to a more shaded area of the farm. This was all with a chilled glass of Avondale Cyclus in hand, a refreshing White Blend of Viognier, Roussanne, Chenin Blanc, Semillion and Chardonnay grapes. The tractor took us back through the vineyards and dropped us off at the main Tasting Room, where we took a seat outside overlooking the gardens. Up first was the Camissa 2018 rosé, a light Blanc de Noir that looks and smells sweet, but is actually the Avondale wine with the least sugar and a fresh dry finish, delicious in the summer heat! On to the reds, Jade poured us each a glass of Samsara 2009, a full-bodied wine of Syrah grapes that ages slowly in barrels for 12-16 months, apparently a popular choice for lunchtime drinking! Our second red and final tasting of the day was La Luna, a Bordeaux Blend aged in oak barrels and consisting of Merlot, Cabernet Sauvignon, Cabernet Franc, Petit Verdot and Malbec grapes, a wonderfully smooth wine to finish! 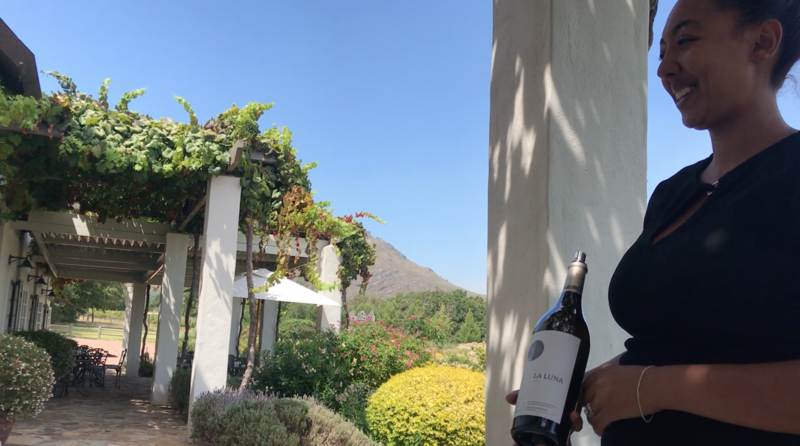 Following the Eco Wine Safari experience we were welcome to enjoy lunch at the Faber Restaurant, wander through the gardens, and purchase bottles of wine to take with us after choosing our favourites during the tasting. Avondale is a premium wine farm that brings class and sophistication to every drop it produces, and makes every effort to ensure their organic ethos is carried from beginning to end. 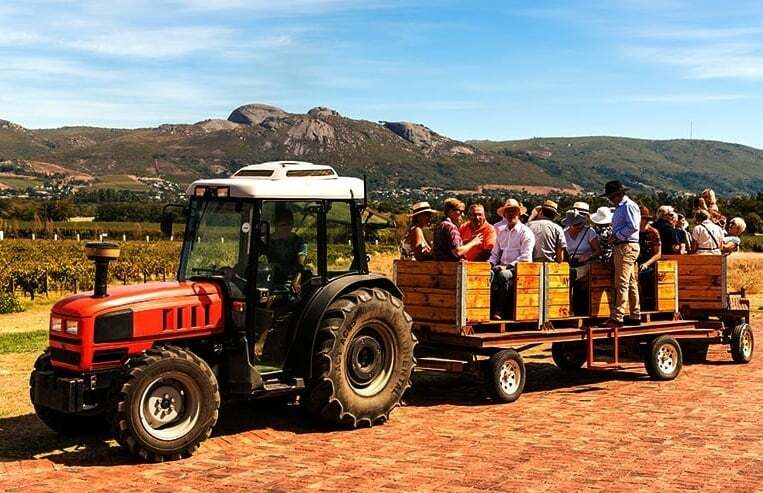 We highly recommend this tour for anyone interested in vegan and environmentally friendly wine making, or simply for an enjoyable winery tour away from the tourist madness of Franschhoek or Stellenbosch. Huge thanks to Avondale for inviting us along!